This year I’m going with more autumn fall decorations for our porch instead of Halloween garlands and ghouls. 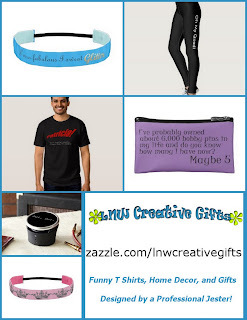 I’m also trying to use what I have on hand with a few little extras here and there. Not only is that greener and cheaper but it will also help me clear a bit of leftover the fabric I have stored in my craft room from my costuming days. High fives all around! I like the garland décor I see all over Pinterest. I think strings of orange pennant flags over the windows and door will be festive. 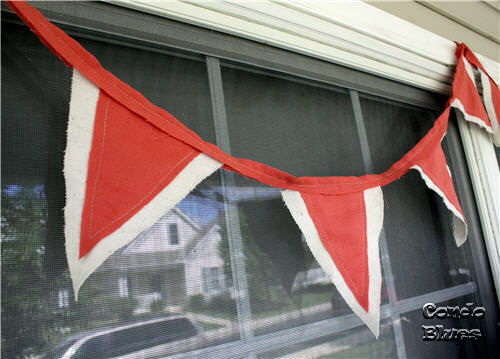 To tie the bunting flags in with the drop cloth house flag I made, I moved into an urban country chic decorating direction (I hope) and made a cloth garland from the leftover orange and drop cloth fabric. Waste not and all that. If you are looking for a plastic free decorating idea, this one’s for you! 1. Make the paper pennant patterns by drawing a large triangle that is 6 inches wide at the top and 8 inches long with the pencil on the paper. 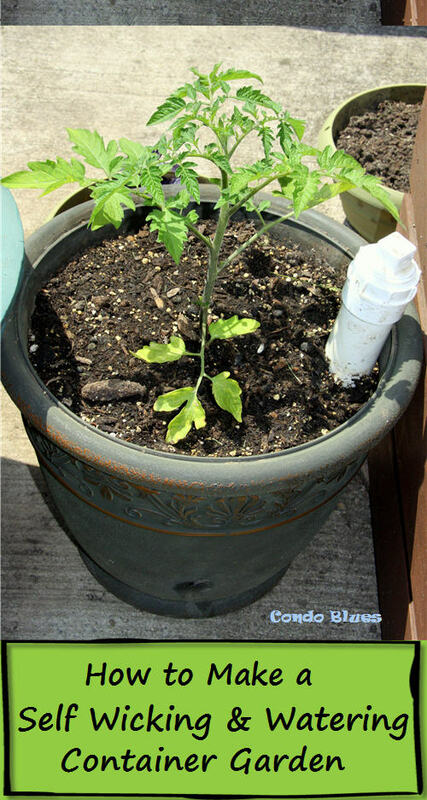 Draw a second smaller triangle that is 4 ½ inches wide and 6 ½ inches long. Cut both paper pattern pieces out with the scissors. 2. 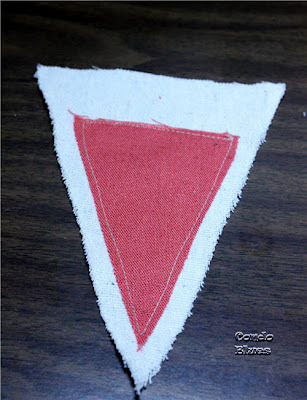 Pin the large pennant pattern to the drop cloth and use the scissors to cut the fabric. I cut 6 large pennants for the door banner and 10 large pennants for the window banner. 3. 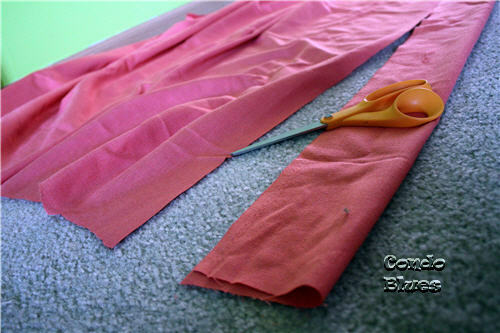 Pin the small pennant pattern to the orange fabric and use the scissors to cut the fabric. I cut 6 small pennants for the door banner and 10 small pennants for the window banner. You might have already guessed the amounts if you read Step 2. 4. 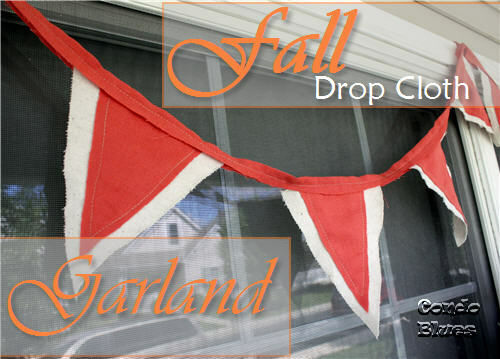 Center and pin the small orange pennants to the large drop cloth pennants. 5. 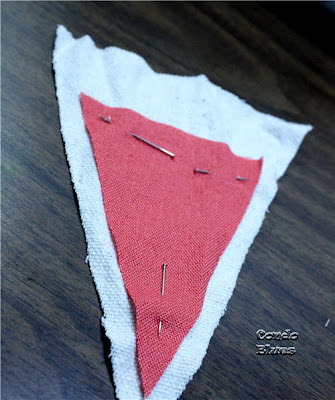 Use the sewing machine and thread to sew each orange pennant to its drop cloth pennant removing the pins as you sew. I used contrasting thread for interest. I also might have been too lazy to change the thread in the machine from tan to orange, but I am sticking to the “for interest” story because I like the look. 6. Measure the length of the area you plan to hang your banner garland and add approximately six inches to that measurement so you have enough fabric at the each of the garland to make a hanging loop. 7. 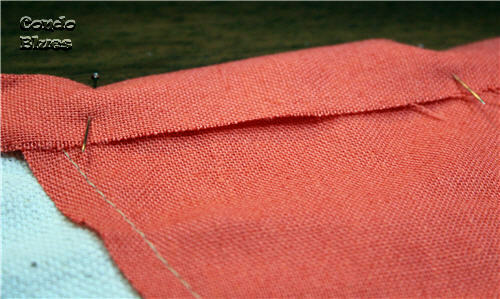 Cut a piece of orange fabric 2 inches wide by your length measurement. This will be the top of your garland. 8. Fold the orange fabric in half and press it in place with the iron. While you are at it, you might as well iron your pennant pieces too. Keep it tidy! 9. Pin the pennant pieces in the folded fabric at intervals that are pleasing to you (I used the width of my hand as a spacing guide.) 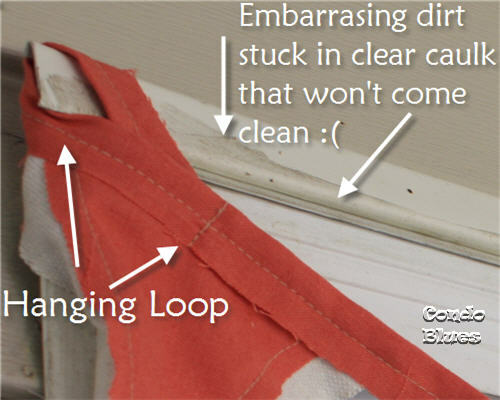 Be sure to leave six inches of fabric on each end of the garland for the hanging loops. 10. Use the sewing machine to sew a straight line from one end of the top garland fabric to the other to sew the pennants to the garland. Removing the pins as you sew lessens the chance of breaking the sewing machine needle late at night when the store is closed. 11. Fold each end of the garland fabric back upon itself to make a hanging loop and sew it into place. If you have any ideas on how to remove the dirt stuck in the clear caulk I'm listening. 12. Optional: Make a fabric hanging loop and attach it to the center of the banner if you want to swag the drop cloth garland. I tuck the center loop in the gap between the window frame and the house to swag the garland. 14. Hang your drop cloth garland and celebrate! All I have to do is shop the house for accessories and my fall porch decorations will be complete! That's really cute a colorful for fall! I am here from Katie's hop. I love this garland. I have lots of drop cloths around, I love the feel and how versatile it is! !